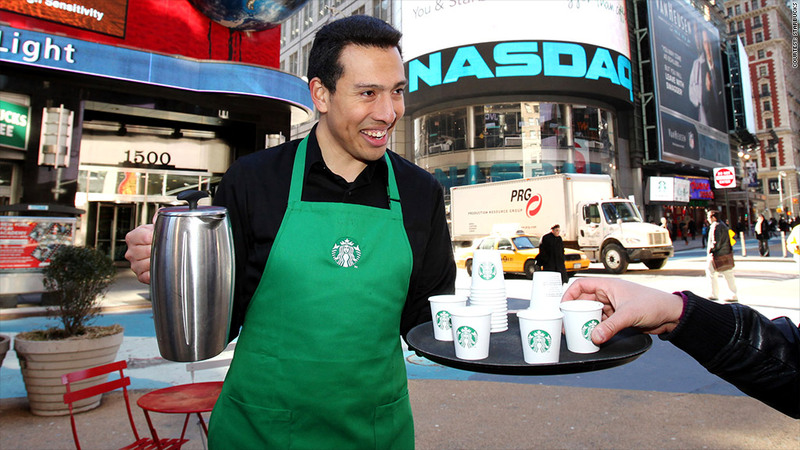 A court ruled that baristas have to share tips with some bosses but not others. The question over who gets to keep the tips at Starbucks finally has an answer. Late Wednesday, New York's top court upheld the coffee chain's policy that tips be shared between baristas and shift supervisors, but assistant managers are still not eligible. The New York Court of Appeals had been asked last month to rule on two lawsuits addressing how New York labor law applied to the tips dropped in the plexiglass box at the counter of Starbucks (SBUX) coffee bars. One suit, brought by the baristas, argued that shift supervisors shouldn't be allowed to get any tip money because the law excludes employers and their agents from sharing in tips given to waiters and busboys. Another suit, brought by assistant managers, argued that the assistant managers should be eligible to share in the tips because they perform enough front-line customer service to qualify. But the court rejected both arguments. In the first case, the court ruled that shift supervisors had very limited management duties and therefore could still receive tips. "An employee whose personal service to patrons is a principal or regular part of his or her duties may participate in an employer-mandated tip allocation arrangement...even if that employee possesses limited supervisory responsibilities," the court said in its ruling. The decision points out that both baristas and shift supervisors are part-time workers who are paid on an hourly basis. But the assistant managers are full-time workers who receive a salary as well as benefits, including quarterly bonuses, paid vacation and sick days. They also participate in decisions to hire or fire employees, unlike the shift supervisors. Therefore, the court ruled that the assistant managers roles made them ineligible to participate in the tip pool. "We believe that there comes a point at which the degree of managerial responsibility becomes so substantial that the individual can no longer fairly be characterized as an employee similar to general wait staff," said the court in its decision. Starbucks was unavailable for immediate comment.